Former first lady Laila Ali has lodged a petition with the UN requesting a judgement declaring former president Mohamed Nasheed’s detention illegal and arbitrary. 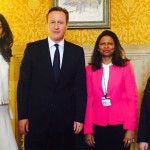 Laila and Nasheed’s international legal team is seeking an opinion from the UN working group on arbitrary detention declaring that his imprisonment for 13 years on a terrorism charge violates the Maldives’ obligations under the international covenant on civil and political rights and the universal declaration on human rights. The charge relates to the military detention of a criminal court judge during his tenure. The UN judgment should also “call for his immediate release; request the government investigate and hold to account all those responsible for his unlawful arrest, detention, trial, and imprisonment; and request the government award Nasheed compensation for the harm caused by being deprived of his liberty,” the petition stated. 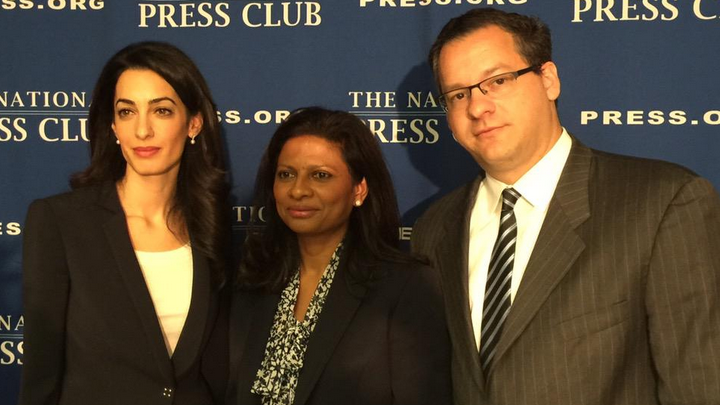 Briefing the US press in Washington DC with lawyers Amal Clooney and Jared Genser, Laila said Nasheed’s absence was difficult for her and the couple’s two children. “[But] I also have hope, I have hope because my international legal team has just filed a petition to the United Nations looking in upon arbitrary detention documenting the evidence that my husband’s detention is illegal and in violation of international law,” she said. She also expressed concern about the health and safety of her husband. “I am here today as a wife and a mother of two young daughters. I have always tried to maintain a private life for myself and for my daughters. I’m speaking out now because my husband has been silenced and not in a position to speak for himself,” said Laila. She noted that Nasheed had been arrested over 20 times during the 30-year reign of former president Maumoon Abdul Gayoom and “subjected to blatantly political trials”. Nasheed’s treatment under Gayoom’s half-brother, current president Abdulla Yameen “is no different, perhaps a tiny bit less transparent,” she said. The terrorism charges followed the exit of Jumhooree Party (JP) leader Gasim Ibrahim from the ruling coalition, she continued, which bolstered Nasheed’s chances of winning the next presidential election. After placing third with 24 percent of the vote in the 2013 polls, Gasim’s endorsement of Yameen in the second round run-off was crucial for the latter’s victory. Nasheed had emerged the front-runner in the first round of polls with 46 percent of the vote. Gasim’s alliance with Nasheed “clearly became too much” for president Yameen, she contended. The criminal court’s 19-day trial violated due process and compromised the basic guarantee of presumption of innocence, Amal argued. She noted that Nasheed was not allowed to present defence witnesses while key witnesses had said they simply assumed Nasheed ordered the arrest of criminal court chief judge Abdulla Mohamed in January 2012. “This was considered more than sufficient for the judges to convict him” said Amal. She contended Nasheed never ordered Judge Abdulla Mohamed’s arrest and said: “Nor could these events even if they true, on any rational analysis constitute the crime of terrorism with the severe penalties that this carries,” she added. Amal said that the court had said that there is no need to call for defense witnesses because such witnesses “would not be able to refute the evidence submitted by the prosecution”. Testimony from two of the three presiding judges were also included in the prosecution’s submission to the trial. 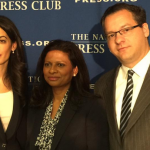 “It’s difficult to imagine a clearer case of judicial partiality,” Amal said. Nasheed was also denied legal representation during the first hearing of the trial, while the judges later refused to grant him the opportunity to appoint legal counsel when the opposition leader’s legal team resigned in protest against the court’s refusal to grant sufficient time to mount a defence. She also referred to police “manhandling and physically dragging Nasheed to the court room” after he attempted to talk to reporters outside the court building. Amal also noted president Nasheed’s global advocacy for climate change and his decades-long struggle for human rights in the Maldives. “He paid the price for his courage and popularity,” she said. A magnificent female role model who can stand tall along side the best in the world! well done Laila. 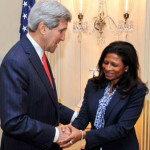 Well done Laila, you are dignified, humble and clear in your courageousness. You are indeed a great example to us all with your clear humanity. You have the best legal team there: they wouldn't back you if they didn't believe in the justice of your cause and that much is clear, no matter what those of small minds may try to insist.. Western machinations etc.. we have heard enough of that rubbish. There is a world outside the Maldives and the Maldives deserves to be part of this world in the best possible way, instead of imploding in its insecure insularity, encouraged by those who profit from it. We have survived so far as a nation precisely because we embraced the outside world while being true to ourselves and our unique national identity. At the moment we are encouraged to do the opposite by a blinkered greedy bunch of playground bullies brandishing arms and an idea of a religion that we can barely recognize in its brutality, so removed it is from the message of peace. These bullies cannot be dignified with a better title than this. Power in the hands of the undeserved is power that will turn on itself in the long run and surely self destruct. Lets not be part of that self destruction.